Picture - Swift F Mk.2 WK242 / "P" of No. 56 Sqn. Manufacturer: Supermarine Aviation Works (Vickers) Ltd. The Supermarine Swift was a British single-seat jet fighter of the Royal Air Force (RAF), built by Supermarine during the 1950s. After a protracted development period, the Swift entered service as an interceptor, but, due to a spate of accidents, its service life was short. A photo reconnaissance variant resolved some of the Swift's teething problems. The Swift evolved from a number of prototypes, the first being the Type 510, a prototype jet fighter. It was based on the Supermarine Attacker, a straight-wing Fleet Air Arm jet with a tailwheel undercarriage, but had swept wings, first flying in 1948; a year after the first navalised prototype Attacker had flown. The Type 510 became the first British aircraft to have both swept wings and a swept tailplane. The Type 510 also had the distinction of becoming the first swept-wing aircraft to take off and land from an aircraft carrier, during trials for the Royal Navy's (RN) Fleet Air Arm (FAA). However, RN interest soon waned despite Supermarine's modifications to the aircraft to improve aspects of its performance. The second aircraft in the ancestral lineage that led to the Swift was the Type 528, which first flew in March 1950. Soon after its first flight, many modifications were made to its structure and it was then designated the Type 535, making its first flight under this name in August 1950. 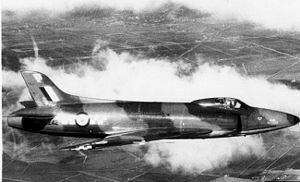 The final variant was the Type 541, a pre-production model of the Swift for which the Air Ministry had placed an order of over one hundred as a fallback in case the Hawker Hunter programme failed. The Swift was also seen by the Ministry as a replacement for the Gloster Meteor in the role of air defence. The Type 541 replaced its predecessors' Rolls-Royce Nene centrifugal flow turbojet engine with the axial-flow Rolls-Royce AJ.65 turbojet engine and its successor Avon engines. The fuselage, which had been given a cross section suitable for the Nene engine, was not redesigned for the narrower AJ.65 and Avon engines. Two Type 541s were produced, the first prototype making its maiden flight in 1951 and the second the following year. The Swift had been ordered into "super-priority" production, a policy created by Sir Winston Churchill who had become Prime Minister in 1951 at a time of particular tension between NATO and the Warsaw Pact during the Cold War; the Korean War had begun in 1950. The first production variant was a fighter designated the Swift F Mk 1, of which 18 were eventually built. The first flight occurred in 1953 and the F.1 entered service with No. 56 Squadron RAF in February 1954, becoming the RAF's first swept-wing aircraft. It was powered by a 7,500 lbf (33.4 kN)-thrust Avon 109 engine and carried an armament of two 30 mm ADEN cannon. The second variant was the F Mk 2, of which 16 were built. It was simply an F 1 with two extra ADENs. However, the addition of these cannons caused problems as the structural modifications required to house the increased ammunition load lead to dangerous handling problems with the aircraft. Numerous further modifications were then required to resolve this issue. The third Swift variant was the F Mk 3, with 25 being built and powered by an Avon 114 engine with reheat. It was never taken into operational service with the Royal Air Force and was used just as an instructional airframe. The next variant was the F Mk.4, which included a variable incidence tailplane intended to correct the handling problems that the Swift suffered from. It did indeed fix the problem; however, it was found that reheat could not actually be ignited at high altitude which added to the problems that the Swift variants suffered from. The next in the line, the FR Mk 5, had a longer nose to accommodate a number of cameras to suit it to a reconnaissance role and had other modifications to its structure. The FR 5 also reverted to the F 1's 2 ADEN armament. It first flew in 1955 and entered service the following year. It performed its reconnaissance mainly at low level, making the reheat problem at high altitude irrelevant. Two further variants were designed; the PR Mk 6 was an unarmed photo reconnaissance variant. However, it was a short-lived program due to ever-present reheat problems. The last variant was the F Mk 7 and was the first Swift variant to be fitted with guided-missiles, being armed with the Fairey Fireflash air-to-air missile and was powered by a new Avon engine. Only fourteen were built and none ever entered service with the RAF, being relegated - along with its prototype missiles - to guided-missile trials duties. 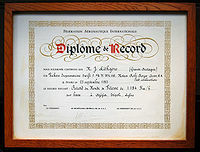 Picture - World Air Speed Record certificate for Swift WK198, piloted by Mike Lithgow. Tragedy began to strike early in the career of the Swift with a number of accidents involving the F 1 and F 2, one fatal. The F 1 was grounded in the August of the same year it had entered service while the F 2, which had replaced the F 1 in August, was also soon grounded. All fighter variants of the Swift were withdrawn from service by the RAF, after a short time in service, to be replaced by the more capable Hawker Hunter. The FR.5 was the last Swift variant to enter service with the RAF and was eventually replaced by the Hunter FR.10, leaving the RAF in 1961. The FR 5 was deemed to be suitable for its role and was based with RAF Germany during the Cold War. The Swift never saw combat action with the RAF. It did break a number of speed records in its time; in Libya, on 26 September 1953, an F.4 (WK198) piloted by Commander Mike Lithgow broke the world absolute speed record, reaching a speed of 737.7 mph (1,187 km/h), though it was broken in turn just eight days later by the Douglas Skyray, a United States Navy (USN) fighter. The Swift has the distinction of being the last British production aircraft to hold this record (the Fairey Delta 2 was experimental). Under two hundred Swifts were built from an order of 497. A number of Swift airframes went to Australia for Operation Buffalo in 1956, being placed at various distances from a detonating atomic bomb. By its last variant many of the problems that had plagued earlier Swifts were resolved but the programme was not continued. The Hunter, performing satisfactorily in the same roles, removed any requirement to persist with the Swift. VV106 (Supermarine 517) is stored by the Fleet Air Arm Museum, Yeovilton, England. WK275 (F.4) on display at Upper Hill, Herefordshire, England. This aircraft represents the definitive fighter variant with slab tail. WK277 (FR.5) on display at the Newark Air Museum, Newark, England. WK281 (FR.5) on display at the Tangmere Military Aviation Museum, Tangmere, England. G-SWIF (F.7, the former XF114) is stored by at Solent Sky, Southampton, England. Data from Andrews & Morgan 1987, p. 297 except for engine and armament. Andrews, CF; Morgan, EB (1987). Supermarine Aircraft since 1914 (2nd ed.). London: Putnam. ISBN 0 85177 800 3. Birtles, Philip. Supermarine Attacker, Swift and Scimitar (Postwar Military Aircraft 7). London: Ian Allan, 1992. ISBN 0-7110-2034-5. Curry, Alan and Frank Goodridge. "The Rise and Fall of the Swift." FlyPast: Key Publications, May and July 1987. Taylor, John W.R. "Supermarine Swift." Combat Aircraft of the World from 1909 to the present. New York: G.P. Putnam's Sons, 1969. ISBN 0-425-03633-2.